Today we are launching these highly-anticipated features to give our investors access to faster liquidity, faster cash deployment, and enhance the tools NSR clients have available to analyze their portfolios as well as any strategy or index views you may follow. 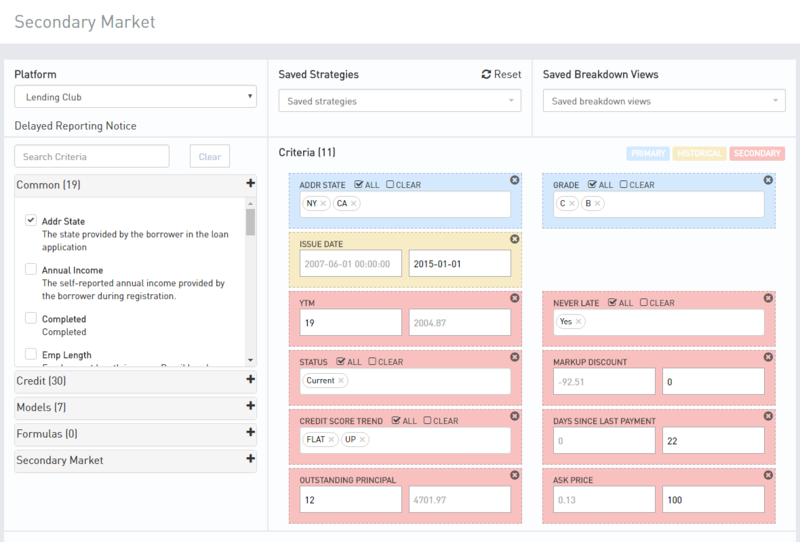 Starting today, NSR Invest clients will have unprecedented access to purchase notes from the Lending Club secondary market with up to 110 available filter criteria options – the most comprehensive automated buying solution available today. 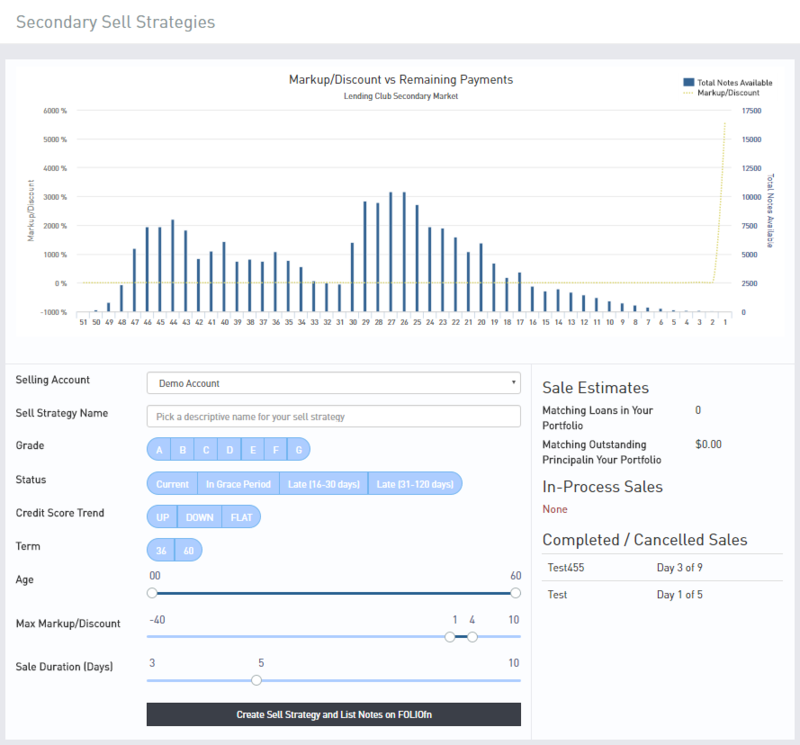 You can now convert your favorite strategy to make it compatible with secondary market buying. There are two different ways to access purchasing for the secondary market – manually and automatically. Self-Directed Lending Club accounts will now also be able to sell notes on the secondary market. Although p2p lending is a longer-term investment, this feature will allow clients the ability to liquidate a portion or all of a Lending Club account. Our helpful dynamic chart allows you to understand the market rate and volume of similar loans listed for sale – making it easier to find a fair selling price for your loans. A popular request from our clients has been the ability to see point-in-time metrics about strategies they are building and their portfolios. Now, with the Historical Data Views module, you will be able to view performance data as of a specific start and end date. You can also see the performance of a set of loans as of a specified payment period. 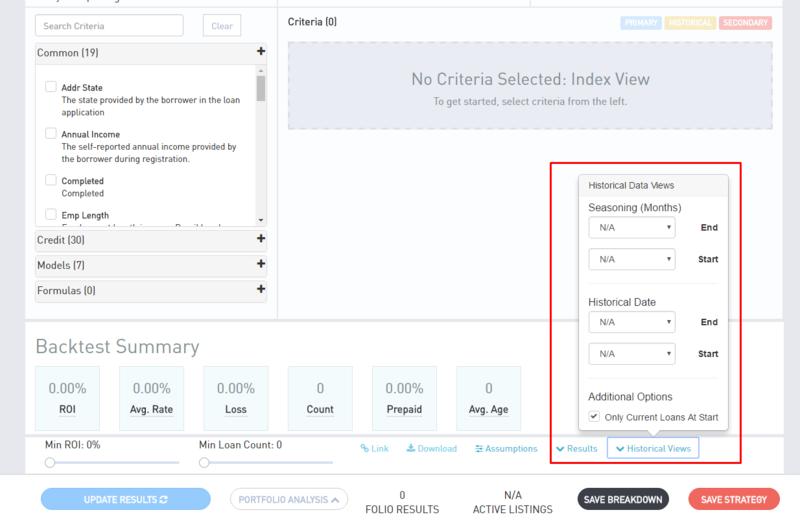 This new feature makes it possible to track cohorts of loans over their duration and make better-informed decisions on performance over similar periods. NSR Invest is focused on helping our clients be successful in achieving their p2p investing goals. While overall ROI or return on investment is an important metric, tracking the standard deviation of different credit attributes in your portfolio can help to assess risk & reward in a more meaningful way. Access by going to “Analytics” for Lending Club or Prosper and selecting the standard deviation symbol to the left of each result breakdown. When analyzing your investment portfolio, it can be helpful to segment different groups of loan investments within your portfolio to consider selling or directly to help evaluate changes you may wish to make to your investment strategy in the future. Access by going to “Analytics” for Lending Club or Prosper clicking “Portfolio Analysis,” select a portfolio and then click “View Matching Note Details” below the Portfolio Analysis button. We hope you like these new features and find them helpful in optimizing your p2p investing success. As always, we’re interested in hearing your feedback, so please let us know what you think! You can chat with us in-app or call us at 720-259-0455. Zach is responsible for product management at NSR Invest and has been investing in peer-to-peer loans since early 2009. He is an entrepreneur with several startups under his belt, and extensive experience with equities and marketplace lending. Through his experience, he brings unique, data-driven insight to our clients to help them better understand how their p2p investments fit into their broader portfolio.